Bitdefender Antivirus Free Edition is an antivirus program designed to be fast and to minimize user interaction, while sacrificing nothing of the malware detection and removal capabilities that Bitdefender products are generally known for. Bitdefender is one of the best security software providers. 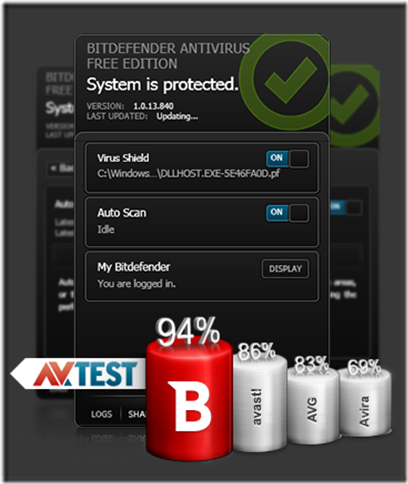 We can trust Bitdefender for their antivirus. Now that they offer a free edition of their antivirus with real-time scanning, it will be a great chance for the users to stay safe from threats. By default, Bitdefender Antivirus Free Edition scans and cleans your system using only the resources that you, your software or your operating system are not using, thus achieving near-zero impact on your activities. 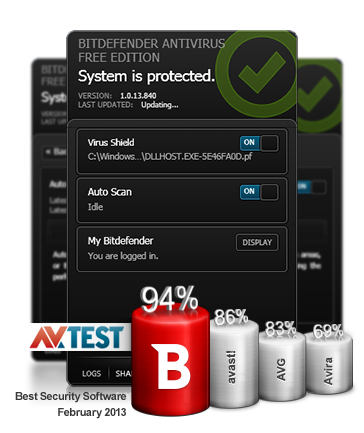 Bitdefender Antivirus Free Edition periodically scans all of your files and handles all security-related decisions for you. This means you will see no pop-ups, no alerts and you will not have to configure any settings whatsoever. Active Virus Control – Active Virus Control is an innovative proactive detection technology that is able to detect new potential threats for which default protection has not yet been released, very fast and accurately, thus providing an essential protection layer. Intrusion Detection System – This technology makes sure that applications trying to access the Internet or the network are not masked e-threats, by marking them whenever its behavior is suspect and by stopping them if the score becomes high. B-Have – B-HAVE proactively detects unknown threats that other products miss by analyzing applications behavior in a safe environment. If no malicious actions are detected, B-HAVE starts the program normally; otherwise, it will automatically quarantine or delete it.